The 12-lead ECG in the Figure was obtained from a hemodynamically stable older adult with new-onset “palpitations”. Is this VT (Ventricular Tachycardia)? Figure-1: 12-lead ECG obtained from an older adult with palpitations. NOTE — Enlarge by clicking on the Figure. Interpretation: Although we are told that this patient was hemodynamically stable at the time this ECG was recorded — knowing this does not help in determining the etiology of the arrhythmia. That’s because some patients with VT may remain alert and hemodynamically stable for surprisingly long periods of time (ie, for hours or longer). That said, knowing this patient is stable does provide an extra moment of time to contemplate your differential diagnosis and management. Unfortunately — there is no simultaneously-obtained long lead rhythm strip. That said, it should be clear that the rhythm is a regular WCT (Wide-Complex Tachycardia) at a rate of ~110/minute without clear sign of sinus-conducting P waves (ie, there is no consistent upright P wave with constant PR interval in lead II). 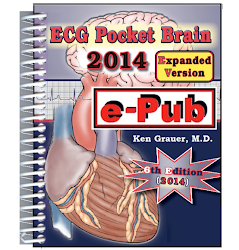 As a result — a ventricular etiology should be assumed until proven otherwise. 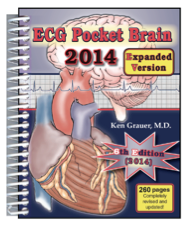 Statistically, more than 80-90% of all regular WCT rhythms that lack sinus P waves will turn out to be VT. Features that increase the likelihood of a ventricular etiology for this tracing even more include: i) Extreme axis deviation (ie, all negative QRS in each of the inferior leads); ii) marked QRS widening (to at least 0.14 second); iii) all positive QRS in lead aVR; iv) all negative QRS in lead V6; and v) QRS morphology not resembling any known form of bundle branch block or hemiblock. 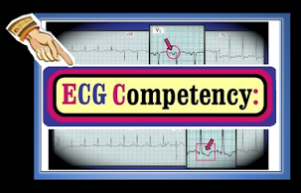 Based on these ECG features, predicted likelihood of a ventricular etiology increases to well over 95% (See our ECG Blog #42 for more details). There is one additional clue that allows 100% certainty of a ventricular etiology in this case (Figure-2). Although subtle — note the presence of unmistakable P waves periodically punctuating the baseline in a number of leads. These are best seen in lead III (before the 2nd QRS complex in this lead, and then notching the end of the QRS of the 3rd beat) — and, in lead aVF (notching the ST segment of the 1st beat in aVF, as well as appearing before and after the last beat in this lead’s recording). These P waves are regular and unrelated to neighboring QRS complexes — which defines this finding as AV Dissociation. Figure-2: We highlight the presence of subtle-but-regular P waves that are unrelated to neighboring QRS complexes (red arrows). This defines AV dissociation — which proves our presumption of a ventricular etiology for this tracing. NOTE — Using calipers is essential if you hope to identify AV dissociation when it is present. Final Comment: The rate of the ventricular rhythm in the Figure-1 is relatively slow for VT (ie, well under 130/minute). 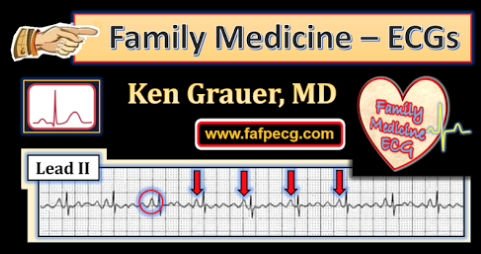 As a result, this rhythm is best classified as AIVR (Accelerated IdioVentricular Rhythm). AIVR is most commonly seen as an “escape” rhythm that occurs in association with acute or recent infarction — or following reperfusion of a major coronary artery. 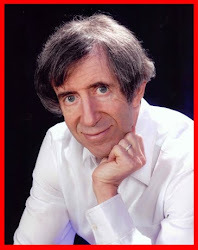 Immediate cardioversion of AIVR is rarely needed, and the rhythm often spontaneously resolves. Clinical correlation is essential for optimal management. 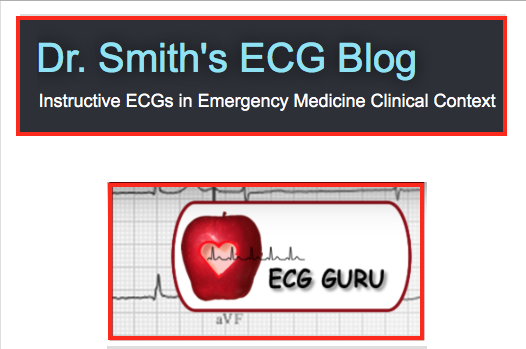 See ECG Blog #42 — for my user-friendly approach to assessing the regular wide tachycardia. 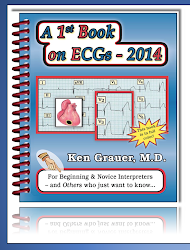 See ECG Blog #108 re recognition and clinical significance of AIVR. 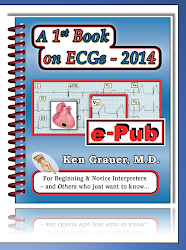 See ECG Blog #133 re utility of AV dissociation for proving VT.
A very interesting ECG interpretation, Prof. Ken Grauer! 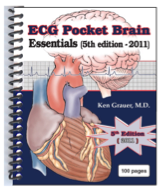 I always look forward to reading your new writings on your ECG blog and your comments in many ECG forums. In this tracing, I find that the first beat in lead D1 looks different from the others in lead D1, but it is the same at the simultaneously recorded-leads D2,D3. So, what is it? Is it a fusion beat or just artifact, sir? Thank you! Positive site, where did u come up with the information on this posting?translation services in Houston I'm pleased I discovered it though, ill be checking back soon to find out what additional posts you include.